Europe has a long history of putting Big Tech under a microscope. "When you are a dominant company in Europe, you are subjected to more scrutiny and responsibility," said Nicolas Petit, a professor at the University of Liege and visiting fellow at Stanford's Hoover Institution. Here are some of the biggest flash points. March, 2004 — Microsoft (MSFT) is fined €497 million ($578 million) by the Commission for breaking antitrust laws by forcing its Windows Media Player on Windows users. The company is ordered to stop the practice. July, 2006 — Microsoft fined €280.5 million ($326 million) for not complying with the 2004 decision. February, 2008 — Microsoft fined a further €899 million ($1 billion) for not complying with the 2004 decision. The fine was later reduced to €860 million. December, 2009 — Microsoft is ordered by the Commission to allow Windows users and computer manufacturers to turn off Internet Explorer and use other browsers. May, 2009 — Intel (INTC) is fined €1.06 billion ($1.2 billion) for abusing its dominant position by paying computer makers to delay or even cancel releases of products that contain chips made by rival AMD. December, 2012 — The Commission fines Philips (PHG), LG Electronics, Panasonic (PCRFF) and other companies a total of €1.47 billion ($1.7 billion) for running two cartels. March, 2013 — Microsoft is fined €561 million ($653 million) for not complying with the 2009 Internet Explorer ruling. May, 2014 — Europe's top court rules that people have the right to be forgotten and search engines like Google must remove certain unwanted links. August, 2016 — The Commission orders Ireland to recover up to €13 billion ($14.6 billion) in unpaid taxes from Apple (AAPL). May, 2017 — Facebook (FB) is fined €110 million ($122 million) for misleading European officials about its takeover of messaging service WhatsApp. June, 2017 — Google (GOOGL) is fined a record €2.4 billion ($2.7 billion) for using its search engine to steer internet users towards its own shopping platform. October, 2017 — The Commission orders Amazon (AMZN) pay unpaid taxes of €250 million ($293 million) after finding that it benefited from an illegal arrangement with Luxembourg. January, 2018 — The Commission fines Qualcomm (QCOM) €997 million ($1.2 billion) for paying billions to Apple not to use chips made by competitors. March, 2018 — Europe tells tech companies including Google, Facebook and Twitter (TWTR) to take down terrorist content within an hour of it being flagged or face new legislation and fines. April, 2018 — The Commission says its investigating Apple's acquisition of music recognition app Shazam. May, 2018 — Europe's new data protection law, the General Data Protection Regulation, comes into effect, setting up new strict rules for how companies handle personal data. 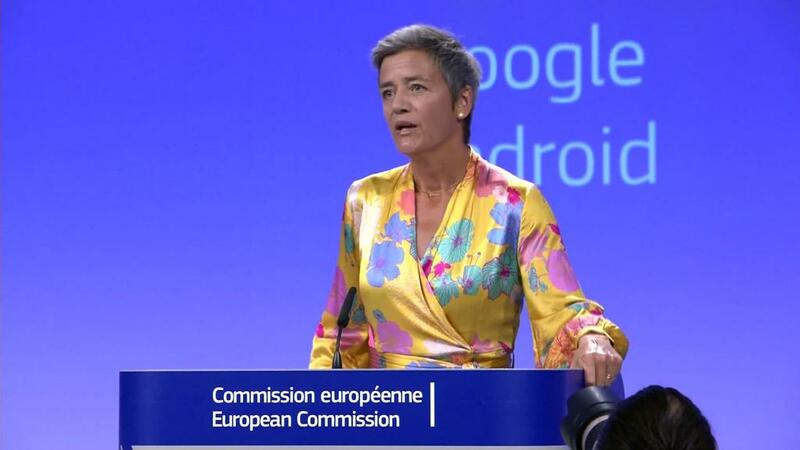 July, 2018 — Google is hit with a new record €4.34 billion ($5 billion) fine over Android.